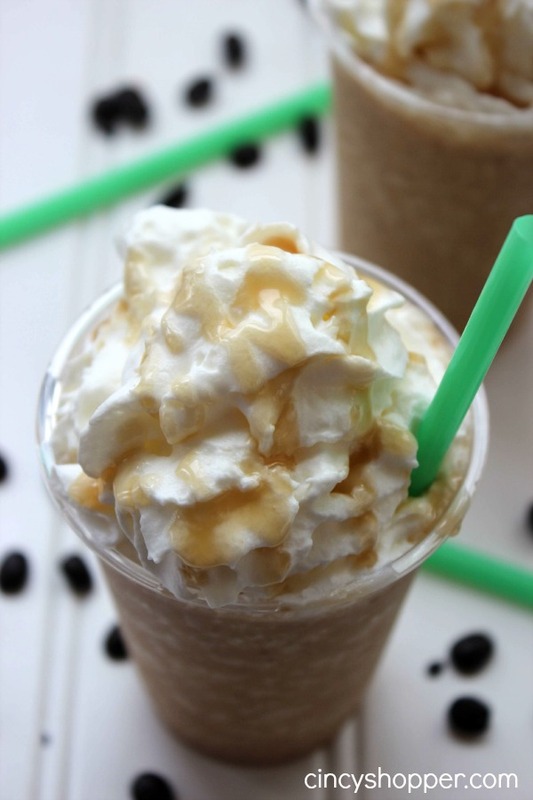 I think warm weather has arrived and I know that this CopyCat Starbucks Caramel Frappuccino Recipe is going to save me some big $$’s this summer. Strabucks is a slight (ok, I can confess… BIG!) addiction that I and my children have. Our addiction kicks in to overdrive mode during the warmer months. We all love Starbucks Frappuccinos. My personal favorite is a Starbucks Caramel Frappuccino. So yummy. There is a slight problem with our Starbucks addiction during the summer months. Most of us have spent up our Starbucks Gift Card balances from Christmas, ha ha. So our addiction becomes quite costly. 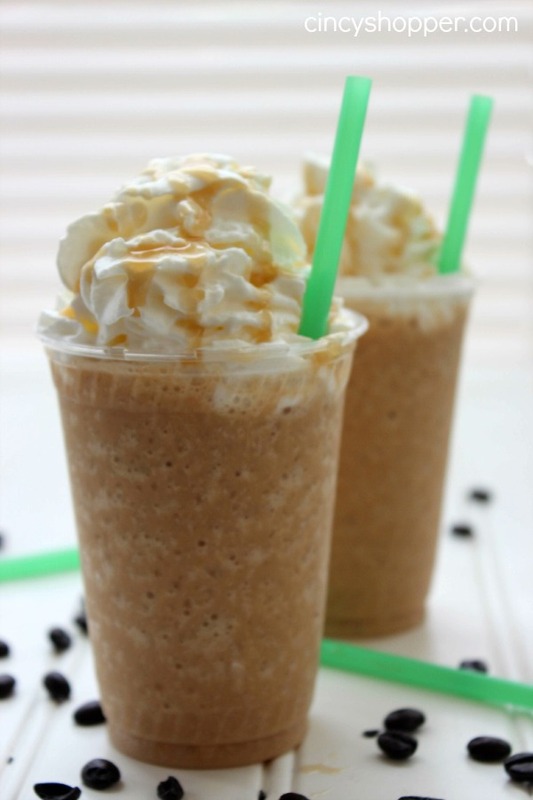 Put cold coffee, milk, sugar, ice, a squirt of caramel and xanthan gum in blender and blend until smooth. Pour into cup and top with whipped Cream and drizzle of caramel. While working on our budget this past weekend the hubby noted how much we had spent at Starbucks this past month. Yikes! I had not realized that the kiddos and I had spent as much as we had. 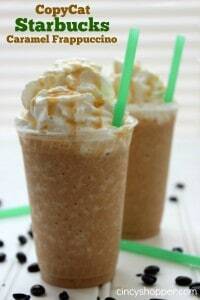 I immediately decided that I was needing a CopyCat Starbucks Caramel Frappuccino Recipe for us to enjoy this summer. I did so well replicating our other favorites Starbucks Passion Tea Lemonade, Starbucks Egg Salad Sandwich and also our CopyCat Starbucks Lemon Loaf so I had real hopes at replicating my other favorite drink. 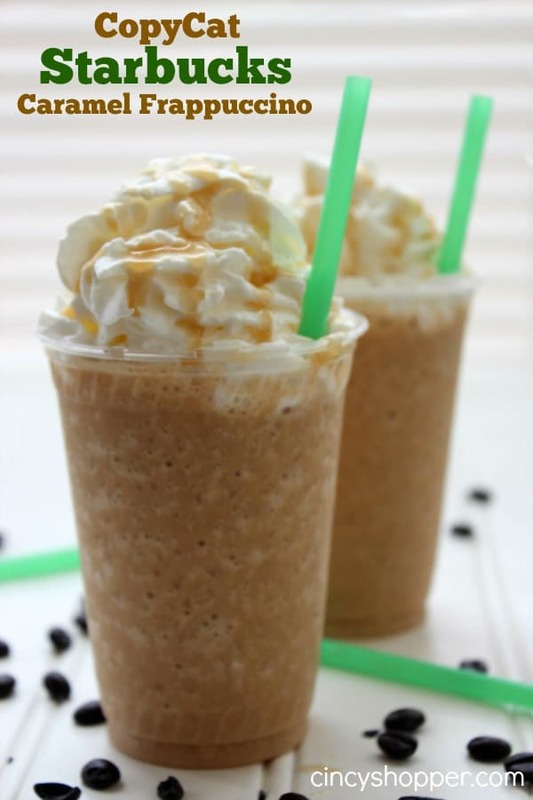 Many CopyCat Starbucks Caramel Frappuccino Recipes online forget to mention one of the key ingredients in many Starbucks Drinks… Xanthan Gum. Xanthan Gum is the ingredient that keeps your drink from separating after being blended. Xanthan Gum can be found in the naturals baking section at many grocery stores including Walmart and at Kroger. You can also order Bob’s Red Mill Gum Xanthan, 8-Ounce through Amazon. The price for mine was around $10 at Kroger. The price may seem quite high but keep in mind the one bag will last you a very long time. You only need just a pinch of the Xanthan Gum to do the trick. 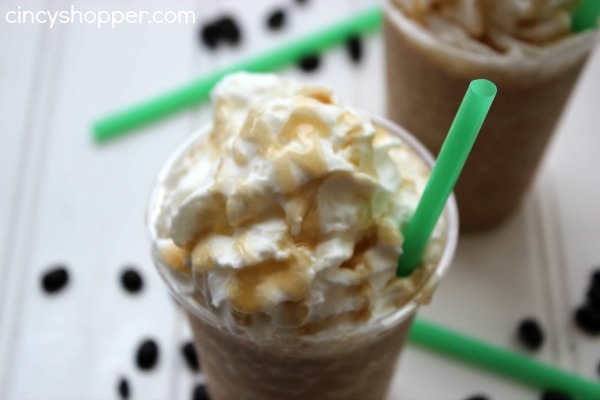 If you are a fan of Starbucks Caramel Frappuccino’s like we are give this CopyCat Starbucks Caramel Frappuccino Recipe a try. We are totally satisfied at how yummy and perfect the recipe turned out. We will definitely be saving huge dollars making one of our favorite Starbucks drinks at home. Are you following my Beverage Board on Pinterest? If not be sure to check it out and follow. I have been pinning some great Summer Beverages to keep all of us cool this summer. This looks amazingly delicious! I’m such a sucker for caramel frappes too! We don’t have a Keurig–any tips on how to use a coffee maker to achieve the same drink? 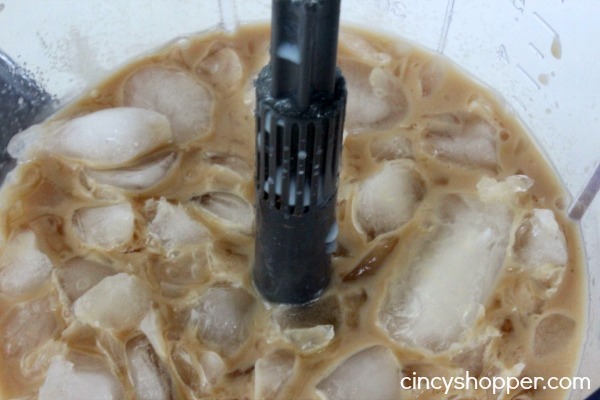 I imagine that making coffee at breakfast and putting the rest in the fridge would be a start–or making coffee ice cubes?? And where can I get the caramel? Where can I buy the Xanthan Gum? Thanks! Hi Charlotte! You can find Xanthan gum in most grocery stores (I purchased mine at Kroger). The Bob’s Red Mill is carried at MANY stores. You can check the health food area. I use such a small amount in my recipes so it goes a REALLY long way. I’m just wondering what you do with all the extra frap? I know if I have a left over frap from starbucks and put it in the fridge it’ll get a little gross. Hi Betsy! You could certainly use a really strong coffee and allow it to chill. The caramel should be at any of your grocery stores. I purchased mine at Kroger. I hope that helps and you enjoy. I found this post from Pinterest and I just wanted to share a recipe I have found that is a bit simpler. I’m a Starbucks employee. During the summer Starbucks sells Caramel Iced Via (instant coffee). 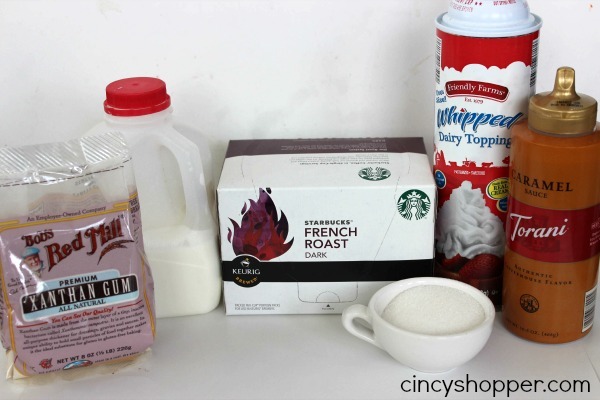 Use a packet of this, a cup of ice, and 3/4 cup of half and half or whole milk. Add a pinch of sugar and aging pinch of xantham gum. Blend well! I love caramel frappuccinos!!! This should help keep some money in my pocket. Thanks for sharing! We are addicted to Starbuck’s too, this will make things much easier! My daughter is going to be so excited. Thanks! Thanks for coming to dream create and inspire party, love the Starbucks copy cat, can’t tell the difference! I just wanted to say Thank You for this recipe! Since I work from home I wanted to start making my own coffee since I’ll only drink dessert coffee’s I purchased a Ninja IQ Blender and I enjoy this recipe more than Starbucks! I stop using the Xanthan Gum and I use Smuckers Carmel sauce(probably more than what i should, but it’s so good!) Thanks Again! It really is a lifesaver! the one i like from starbucks this summer was s’more frapp.have’nt figured out how to make it at home. Smuckers has a marshmallow topping and a hot fudge topping or maybe some Hershey syrup. Add some graham cracker crumbs. Haven’t had a s’mores one so I’m not sure how one tastes. A s’more is marshmallow, chocolate and grahams. I would experiment! I love Starbucks !!! I will have to try this!!!? Mmm, this looks delicious! I love the idea of frugal Starbucks! Thanks for sharing at Merry Monday! Neat idea, thanks for sharing with the Delicious Dishes Recipe party This week!